This is the second fuel filter in the fuel system after the one in the fuel tank. The carb has an internal screen type fuel filter located just off the fuel intake. 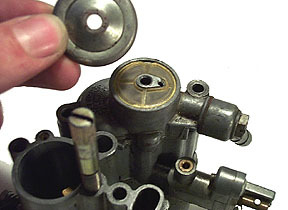 This filter can be reached with the carb either in or out of the bike (as shown). Just make sure the fuel tap is on "off" if you are working inside the carb box. 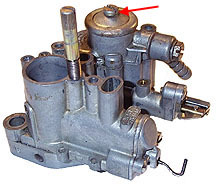 Above is a typical 200cc Vespa carb with the filter location noted with a red arrow. 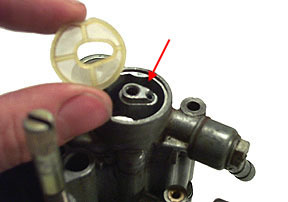 Unscrew the single screw to gain access to the internal fuel filter. The filter is sometimes a tight fit but there is a small dimple in the side that is used for hooking it out of the carb body. Clean the filter in new gasoline and be sure to check for sediment in the bottom of the filter bowl (shown with a red arrow above). Any sediment can be lightly scraped or blasted out. If there is a large amount of garbage in here it is probably a good idea to check your fuel tap filter as well because it should be filtering the fuel pretty well before it reaches the carburetor.